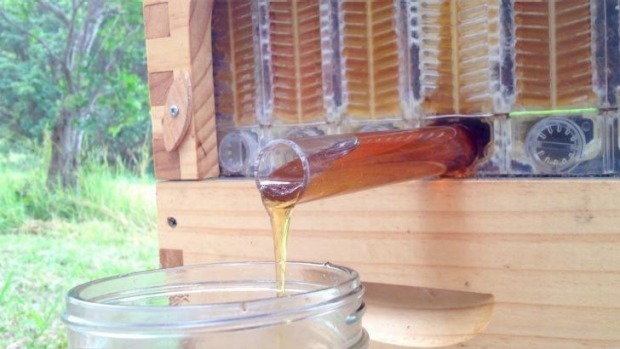 It sounds too good to be true - honey direct from the hive with just the twist of a tap. In Canberra on Monday an Australian father and son team of inventors will reveal to the world an ingenious design they hope will spark a backyard beekeeping revolution. 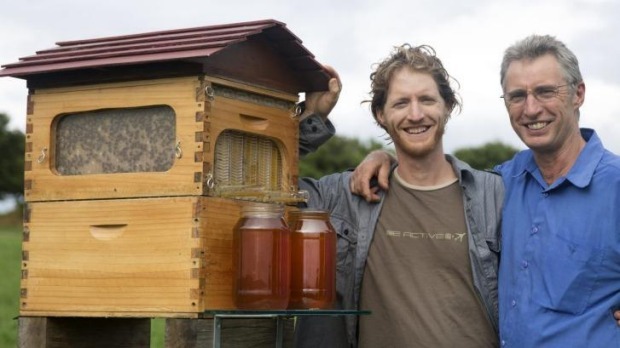 Sick of smoking their bees and dismantling hives to retrieve honey, Cedar Anderson and his father, Stuart, began working on a more efficient beehive design a decade ago from their home on the NSW north coast. After years of building and testing prototypes they are about launch a crowdfunding campaign on Kickstarter to bring the system into full production. The flow frames at the heart of the design fit inside a standard bee box, but unlike traditional frames contain partially formed honeycomb cells that slope down at an angle. In the hive the bees fill the cells and seal the top with wax. Once filled, the turn of a handle on the unit splits the cells in half, allowing the honey to flow down the middle and out through a pipe at the bottom. Cutaway sections on the outer box allow beekeepers to see when the transparent cells are full. "I remember Cedar sitting around our kitchen table saying, 'there must be a better way' and I just couldn't imagine it, but he kept beavering away and after a while I got intrigued. Soon he started making up little prototypes of what might work, and then after many months we realised we were on to something," Stuart Anderson said. To raise initial interest ahead of the funding campaign the Andersons put together a promotional video they hoped would be seen by a few hundred beekeepers interested in the concept and started circulating it on Facebook. What they didn't anticipate was that the video would go viral and become a social media sensation. "It seems naive now looking back at it, but we really didn't anticipate the response at all. Within an hour or so of it going on Facebook 3000 people had viewed the video and we thought, 'gee, that's amazing', but last time I looked it had been seen 1.4 million times, which is something I just can't comprehend," Mr Anderson said. Owner of Tyagarah Apiaries Australia Michael Howes agreed to test the design and was surprised how quickly the bees adapted to it. "I put the flow box on one of my hives, the bees took to it straight away. The honey came out clean, no wax. The bees just remove the capping and start filling it again," Mr Howes said. Mr Anderson said as well as the convenience, one of the other major advantages was that the system meant less disturbance for the bees, which could stand undisturbed on the surface of the cells while the honey was drained out from under their feet. "One thing we hadn't realised but that an experienced beekeeper pointed out to us is that it's going to mean a lot to people keeping bees in an urban situation in their neighbourhood because most of the time bees take off and mind their own business, but they get upset and sting people when you open them up and disturb them. With our design the bees are busy at the front of the hive while we drain honey out of the back, making it much safer." He hoped the hives would also assist beekeepers in the important role they played pollinating crops. They hope to raise $70,000 for the Flow Hive crowdfunding campaign when it launches on Kickstarter on Monday.